I blog this morning from a Peet's Coffee shop in Chicago. I arrived two days ago to be a part of a project launched by Loyola Productions entitled "The Jesuit Rec Room." 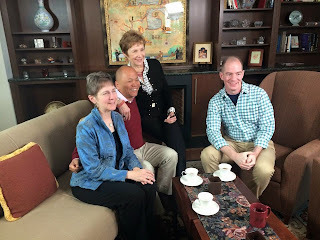 The gist of the series is simple: to recreate the sorts of conversations that often take place when Jesuits and friends gather in social settings. My suggestion was to call the series "...and another thing!" because Jesuits are often loath to give the last word to anyone. My suggestion did not gain traction. Nevertheless, I truly enjoyed being a part of the project. Our panel yesterday consisted of four members: Father Radmar Jao, SJ, Sister Nancy Sylvester, IHM, author and speaker Caroline Myss, and me. As our microphones were adjusted and we sat chatting, I shared with the group a funny incident that took place a few years ago. Standing in the Denver airport with my accordion on my back, a man grabbed me from behind and inquired excitedly, "Are you the Tin Whistle priest?" Although not ordained, I understood his question and affirmed my identity. He seized his mortified girlfriend and said to me, "Oh my God! We listen to you in our bedroom." I went from tin whistle teacher to the bedroom soundtrack. A high point in my life. The name, "Tin Whistle Priest," struck Caroline in particular as an appropriate name for my blog. And, I must say, I quite agree with her. Last night, after I prayed, I toyed with the name "The Whistling Priest" or the "The Whistling Jesuit" or even "The Musical Priest." But, at the end of the day, I feel as though "The Tin Whistle Priest" is a pretty good name for who I am. In Saint Paul's Letter to the Corinthians, he proclaims: "If I preach the Gospel, this is no reason for me to boast, for an obligation has been imposed on me, and woe to me if I do not preach it." If I preach the Gospel, it is because I have received it as a gratuitous gift that impels me to share it with others any way I can. If Irish music can help to introduce people to the Good News of Jesus, then woe to me if I do not use any and every means at my disposal to do so. So, although it's 22-days premature, I'm changing the name of my blog. Within the scope of nearly eleven years of blogging, three weeks doesn't seem too much of a stretch. As I shared with a person for whom I pray daily, I try hard to be a faithful disciple. I'm not very good at it, but I try. I daily experience the impact of the Jesuit vow formula which acknowledge "how unworthy I am in your divine sight. Yet I am strengthened by your infinite compassion and mercy, and I am moved by the desire to serve you." Over the years, this desire to serve has only grown. It's not always been a smooth path, or without obstacles, but I continue to feel called and, somehow, I have been given the strength to respond. While "The Tin Whistle Priest" is not a name I'd have chosen, it is the name I have been given by others. Maybe this, too, describes how much of my own priestly formation has been: I did not form myself for priesthood but was formed by the communities I've had the privilege to serve. From hospital patients as a CPE student to high school students in Detroit, they have so shaped me that it will forever be our priesthood. Ordination is not something of which I can boast but is the obligation to recognize what others have seen and affirmed in me.